Smoked Grouse Crostini by Great Glen Charcuterie. Slice the bread in even slices and grill on both sides for a nice crust. Toast the hazelnuts briefly and crush into small pieces. Bring the brambles slowly to the boil with the orange juice until soft. Push the mixture through a sieve with the back of a spoon. Mix the cooled bramble juice with a few tablespoons of oil and season with salt and pepper to make the bramble sauce. 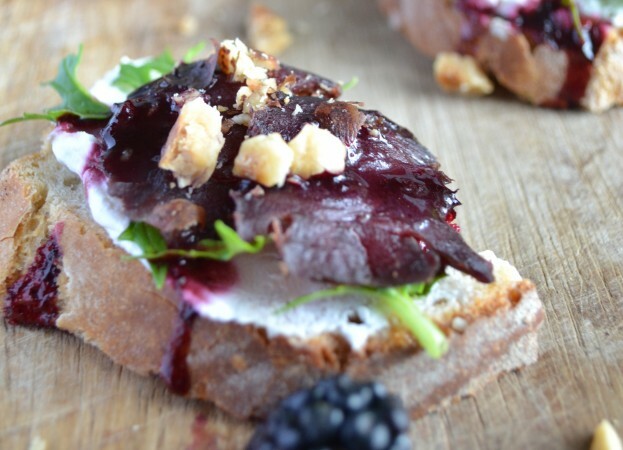 Take a crostini and spread the goats cheese on top, add a few leaves of rocket and top with a couple of slices of the grouse breast. Drizzle with bramble sauce and garnish with crushed hazelnuts. These Smoked Grouse Crostinis make a nice sharing starter or you can make them smaller for canapés. This recipe was developed for the Game to Eat campaign promoting the delights of British game meat.